The grim power scenario in India, affecting the manufacturing industry’s competitiveness, forces power intensive process and discrete industries such as aluminum, automotive, cement, chemicals, metals, refining, and textiles to establish Captive Power Plants (CPPs) to generate power to meet their internal demand. Typically, CPPs, while providing reliable power to the mother unit, operate as cost centers, but after the promulgation of the Indian Electricity Act 2003 following the deregulation of India's electric power industry and its unbundling, the situation has changed dramatically. Stakeholders of CPPs can now sell the excess power from CPPs by entering into power-trading arrangements. CPPs can potentially earn revenues and thereby provide manufacturing companies opportunities to maximize the return on investments. While operating a captive power plant always posed serious challenges relating to their operation, optimization, and maintenance, the business challenges have added new dimensions. India has not been able to attract investments from pure play independent power producers, and large utilities are under tremendous financial and other constraints. Viewed in this context, CPPs can play an important role in easing the power position. The country is expected to add close to 10,000 MW of generating capacity through the CPP route in the next five years, involving a capital investment of close to Rs. 350,000 million. Presently, the country's demand for electric power exceeds the generating capacity by about 7-10 percent, and with the acceleration of India’s economy, the manufacturing industry has only one recourse — build and operate CPPs. With close to 2,000 MW of generating capacity being added in the CPP sector, we see signs of that happening. The country has enough manufacturing and engineering capacity to support this augmentation. With industries being in a position to find adequate capital and medium-size CPP projects being commissioned within 15 to 24 months timeframe, this sector will witness rapid growth. Automatically regulating the plant process is typically addressed by plant automation systems. A conventional multi fuel-fired power plant operating at variable loads involves designing a control system subjected to multiple constraints. The process cycle in a typical boiler-steam turbine plant is tightly coupled. For example, the flue gas heats the combustion air and transfers heat energy to the feed water through boiler economizer. The turbine steam extractions also heat up the boiler feed water. The super heated steam temperature involves water attemperation and possibly flue gas by pass controls or burner tilt controls. Control valves, used for controlling the feed water or the attemperation, do not provide controllability over the entire load bandwidth. Superimpose on these interconnected process cycles and final control equipment constraints, the multiple fuels that may be used and variable load operational requirements to appreciate the operational challenges from the plant automation perspective. While automation solutions are available to address these traditional control engineering challenges, achieving operational excellence in the case of a captive power plant go far beyond these. A process plant may actually have more than one CPP. While this provides many operational options to the main process plant, ensuring that they are operated at their best productivity levels or most efficiently calls for unit optimization controls. The operational imperatives dictate optimal load distribution in the case of the multiple generators, plant operation at the best possible heat rate, while maintaining combustion and emission control. Applying optimization control necessitates the integration of operational information from different units into model based optimization control systems. 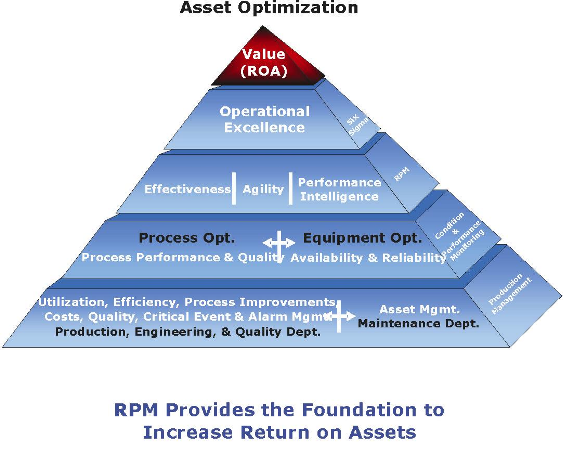 The equipment and other plant assets have to be managed efficiently to maximize the return on assets. The challenge before CPPs is to produce power at lowest cost, deliver reliable power to the industry, and export power to the grid while maintaining grid discipline. Essentially for a CPP to deliver full value as a profit center calls for optimizing its ability to meet the internal demand for power while making available to the external grid the committed power. The other imperatives are to operate CPPs at the highest efficiency levels, maximize plant availability, reduce downtime, schedule electricity generation to meet in-house and export demand. The CPP has to be operated optimally to balance its revenue generation potential while meeting the in-house demand for electric power. Downtime is expensive and the challenge is to maximize plant availability through the adoption of predictive maintenance techniques. These operational challenges demand that CPPs adopt state-of-the-art process control, implement process optimization, and manage the plant assets to increase returns. While achieving operational excellence is the goal of CPP stakeholders, the means include real-time performance management by setting key performance indicators. Kilocalories of fuel consumed for generating one unit of power may act as a key performance indicator while measuring the CPP operational efficiency, but in the case of plant operator, the key performance indicators may include maintaining the controlled parameters within the operating limits. While the plant availability could act as a performance indicator in the case of plant maintenance department, the CEO of the company is interested in plant profitability, return on assets, and such other business goals. Captive Power plant is part of the main plant and comprises of other auxiliaries such as water treatment plant, ash handling plant, coal handling plant and such others. The main plant has disparate centers of plant parameter and business information monitoring systems. While plant level automation involves dealing with real-time information and control, the business level information may be predominantly transaction-based activity influencing the business aspects of the company. The execution level activity involves synthesizing the business level information and goals with the operational decisions. Dictated by operational and functional requirements, implementation strategies, procurement policies, design considerations, and such others, the main plant might have adopted disparate automation systems and IT solutions such as ERP, CMM, and others implemented at varying times. Integrating all the information and creating a unified real-time database is the basis for arriving at KPIs, which act as internal benchmarks for different decision makers, spanning plant floor decisions to board-level decisions. Empowering people with production floor, execution layer, and board-level information effectively results in Real-time Performance Management (RPM). Continuous tracking of KPIs, their analysis, initiation of appropriate corrective measures, and reckoning with the feedback results in CPPs achieving operational excellence.